Started by the Rotary Club of Gerringong in July 2007, the market has now built an enviable reputation amongst visitors and locals alike. This reputation has been built on the vast variety and excellent quality of our market stalls. Ranging from handmade crafts, local produce, toys, books, jewellery, plants and the most exquisite clothes, there is bound to be something of interest for everyone. Combine this with delicious hot food stalls, coffee and cakes and you have a perfect day out. The stalls are located both inside and outside the Town Hall, so hail, rain or shine, this boutique market takes place in all weather conditions. The Rotary Club of Gerringong organise and run the market as a community service, raising funds for both local and overseas projects. Each month, the Gerringong Village Market offers other local Community and Charity Organisations a free site for their own fund raising. Make sure you have plenty of time, not only to browse our many and varied stalls, but also to visit our extensive local specialty shops and cafes in Gerringong and take in the beautiful South Coast scenery and beaches. Gerringong, a small coastal village on the South Coast, is only a 90 minute drive from Sydney and 20 minutes from Nowra with beautiful coastal views and a welcoming atmosphere. 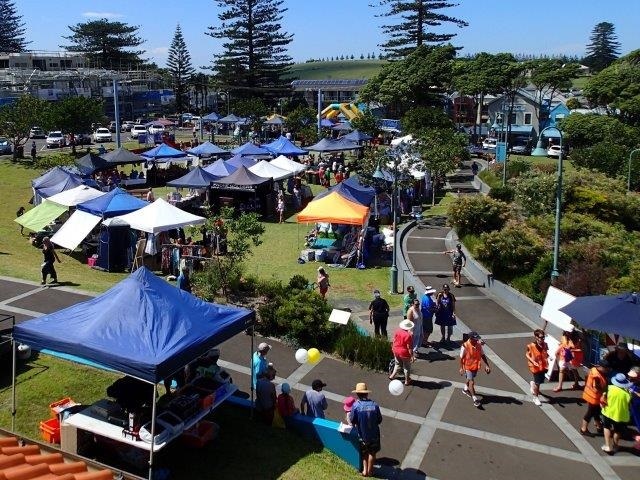 The Markets are located in the heart of Gerringong's town centre, in and around Gerringong Town Hall.